The environmental situation in Ukraine is becoming critical. According to the World Health Organization, because of poor state of the environment, three people die in the country every two hours. In 2018, Ukraine ranked 109th in the countries’ rating according to the environmental efficiency index. Despite this, environmental problems in the country are not a priority. Generally speaking, the environmental issue is a global problem. Business is part of the global ecosystem and cannot stay aside from global issues. 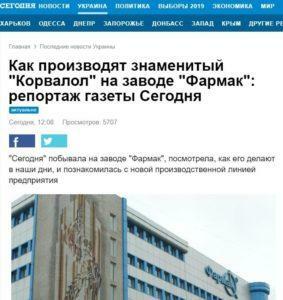 Farmak – the leader of the Ukrainian pharmaceutical market and one of the largest exporters – is not an exception. “We are building European production here, in Ukraine. Therefore, environmental issues are priority for us”, noted Filya Zhebrovska, Chairman of Supervisory Board of Farmak JSC. The company spends about UAH 14 million annually for environmental projects. This year, Farmak has launched the environmental project of mini-grants Eco School and involved the All-Ukrainian Youth Movement ‘Let’s Do It, Ukraine’ in its implementation. This is a long-term information and awareness-raising project, in which children not only gain environmental knowledge, but also learn to consider the economic efficiency of a sparing attitude to natural resources, make presentations, learn the basics of project management, etc. Based on this knowledge, students develop independent projects for their schools aimed at addressing ecological problems and rational use of environmental resources. The best projects are awarded mini-grants for implementation from Farmak. By September, the students’ ideas will be put into practice. 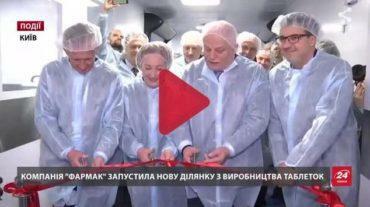 The first Eco School was launched in Shostka, where Farmak opened its API (Active Pharmaceutical Ingredients) Manufacturing Department. Incidentally, this production site is equipped with state-of-the-art equipment and modern waste treatment systems with efficiency of 95-99%. The company invested more than € 500 thousand in the treatment facilities for the API Manufacturing Department. The implementation of Eco School pilot project was started this year in March. Nine local schools took part in the program. 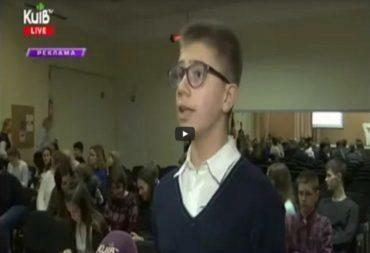 During the first stage, school activists, 8th -11th grade students, underwent special training for 3 months. School eco-teams attended trainings specifically designed for the project. The children learned about the basics of environmental thinking and lifestyle, specifically, how to save the planet and spare natural resources, how to prepare an environmental project for their school and thus contribute to preservation of balance on the Earth. 90 children taking part in the project not only learned themselves, but also taught their relatives to cut down consumption of water and electricity, properly sort garbage, etc. “In my opinion, the most efficient way to change adults’ attitude towards environmental issues is to act through children. When a trained child tells parents how to save electricity or water, adults will respond faster than to a law on paper. We actively promote such changes, this is why we have decided to launch the Eco School project”, told Mrs. Zhebrovska, “For instance, new rules for sorting waste in accordance with the Law “On Waste” took effect in Ukraine since 01 January. Similar rules have long been introduced in Europe and have become the basis of their culture and way of life. Now in Ukraine everyone is required by law to sort garbage by categories: glass, paper, and polymer materials. These changes will occur together with changes in consciousness and awareness of the Ukrainians, development of a culture aimed at rational use of natural resources”. To encourage children to share their knowledge with relatives, the teams also created information fields in their schools so as to promote the benefits of proper use of natural resources among all students. They also visited Farmak’s production facilities and saw the implementation of the company’s environmental approaches and principles into practice. The projects developed by the students for their schools were presented in June. Among them were a winter garden in one of the study rooms, installation of LED lamps, introduction of a garbage sorting system, etc. A competent jury including representatives of the town authorities and Farmak company identified the winners. Shostka school No.1 addressing the issue of eco-friendly transport and alternative energy sources took the first place. Its students proposed to arrange a bike parking lot near the school and create a bicycle that would generate electricity. The second place was taken by a gymnasium with the project “School drinking water fountains”, and the third – by school No. 11 with the project “Sensor water taps”. The winners received mini-grants for the implementation of these projects from Farmak amounting to UAH 20,000 UAH 15,000 and UAH 10,000, respectively. Project goal: to raise public environmental awareness. Project achievements: implementation of the pilot project involving up to 1,000 persons in Shostka. Development of a unique methodological base. Students’ projects pending implementation. Conditions of successful project implementation: involvement of business, authorities, public organizations, educational institutions throughout Ukraine. Company’s contribution (investment) to the project: development of methodology, mini-grants for project implementation, organizational costs. Need for further investment (partners): both businesses, and public organizations can act as partners. Today, there is no doubt that Ukrainian business will have to change its attitude to the environment. Environmental laws gradually become more stringent. The Cabinet of Ministers has approved the National Plan for Emission Reduction from Large Combustion Plants developed by the Ministry of Natural Resources together with the Ministry of Energy and Coal Industry, international experts and energy generating companies for the period until 31 December 2033. According to this document, entities undertake to implement environmental measures to decrease volumes of pollutant emissions and improve the state of atmospheric air. Ukrainian businessmen need to realize that European integration of Ukraine is impossible without addressing environmental issues. When choosing partners, European businesses primarily consider companies’ environmental and social programs. “We urge Ukrainian businesses to support our Eco School project. We have made the first – most difficult – step: developed the methodological documents, implemented the pilot project, improved it and are ready to share our experience. The Eco School project has already entered the Top 20 Social Projects of Ukraine in 2018. We are deeply convinced that the environmental situation in Ukraine can only be changed by raising public environmental awareness. Changes should start with ourselves, our families, schools, streets, cities. After all, only together we can do more: reach more cities, more schoolchildren. Inspire the entire country with an idea of an eco-friendly society. Make another step in the bright future with clean air and water. Join us. Farmak has proved that close cooperation between businesses, government and public organizations yields results”, summed up Filya Zhebrovska.